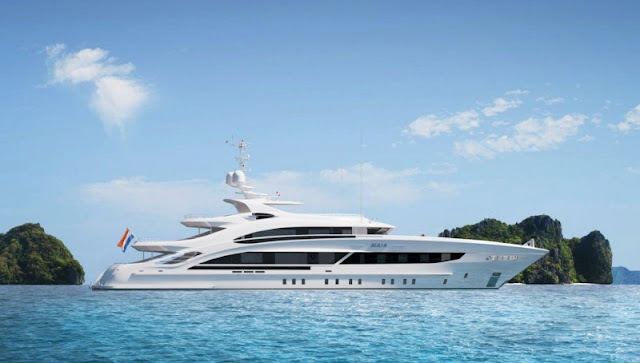 The steel-hulled, full-displacement motor yacht from the Dutch yard is based on the same technical platform as its award-winning 164-foot superyacht Ann G launched in 2015. Featuring in-house naval architecture and engineering, Maia has the stance of a large cat ready to pounce, thanks to its exterior by Clifford Denn Design. Curvy, flowing forms and sharp knuckle lines are accented with subtle nods to automotive design such as the “Fisker whiskers” of the aft fashion plates and contemporary navigation lights. 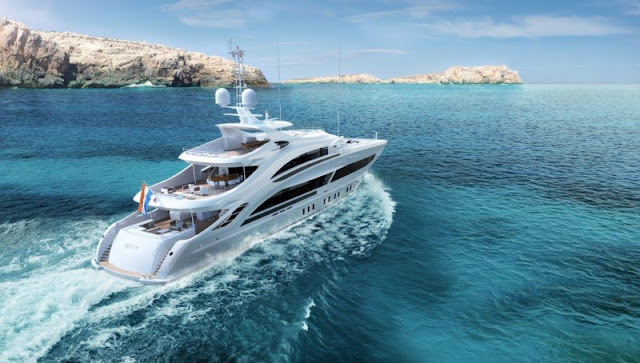 The yacht’s sporty aesthetic is accentuated by Heesen’s traditional pelican bow with a reversed sheer line. Maia offers up no less than 250 sqm (2,690 square feet) of deck space arranged over three levels, an accomplishment made possible by well-positioned tenders carried on the fore deck where they can be quickly deployed. A wavebreaker at the front of the tender storage deflects splash. As a result of this out-of-the-way stowage, outdoor enthusiasts can spread out on the stunning 52-foot sundeck, which has ample room for the yacht’s most impressive design feature: a spacious beach club with a bar, a sauna, and a stellar sound system. 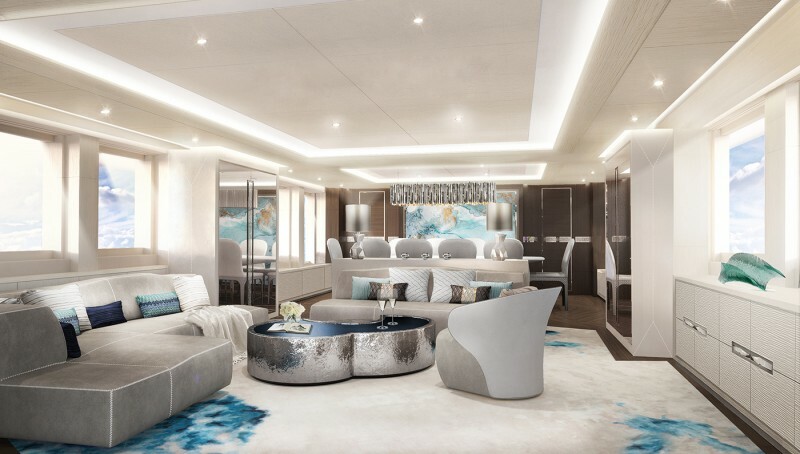 The bridge-deck sky lounge is an adaptable area dedicated to rest, with large windows and full-height glass doors opening to sea breezes by day, but then providing a more intimate setting by night, in which to hunker down while bathed in soft lighting once the sun sets. Powered by two MTU 1,340 hp engines, Maia will reach a respectable top speed of 15 knots, with a range of 3,800 nm at its cruising speed of 12 knots. Maia’s many distinguishing and practical exterior design features are complemented by a bright and modern Reymond Langton interior, which has been executed with both owner and charter guests in mind. 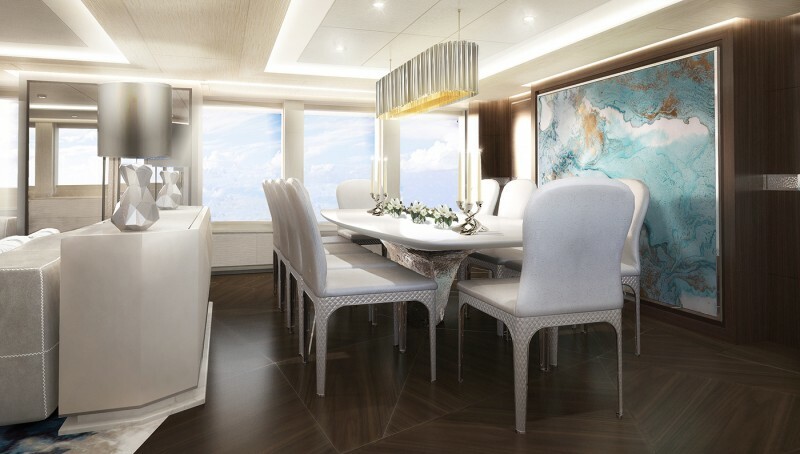 Calming, soft tones are combined with bespoke furniture that echoes the geometric elements of the striking artwork and a walnut-clad main staircase rising through the yacht. A thoughtful LED lighting concept washing the ceilings and walls in a warm glow creates an inviting atmosphere, as does the use of contrast between light, bleached oak, and stained walnut. A subtle graphic motif runs throughout, punctuated with textured metal and feature fabrics. 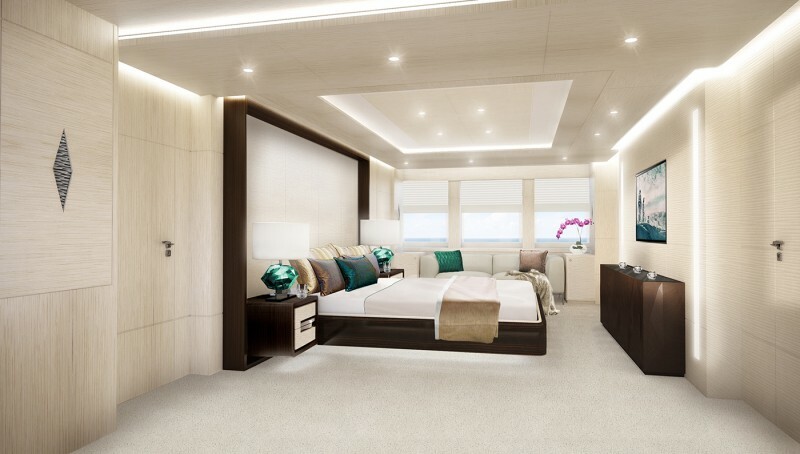 Accommodating up to 10 guests in five staterooms, the main-deck owner’s suite has a private office that leads to the generous full-beam bedroom in which large windows provide panoramic views and plenty of natural light. A roomy bathroom in oak and limestone features stained walnut and a Volga blue granite vanity. Four lower-deck guest suites (three doubles and one twin on the lower deck) are again light and airy, and 10 crew members are accommodated in five cabins.